Game of Thrones, Season 5 – The Gift – What are you reading? In the latest episode of Game of Thrones, Lady Olenna Tyrell shows her thorns, Sansa can’t catch a break, Jorah puts on a show and Cersei gets what’s coming to her. Will poor Sansa ever catch a break? I mean, does she have a curse on her or something? When will something good happen to her? No time soon, it seems, as we saw in this episode. After her horrific wedding night, Sansa has been locked in her chamber all day and abused by her husband Ramsay at night. When Theon/Reek comes by to bring her some food, she begs him to help her get away. She tells him what to do and hands him the candle given to her by a servant. When Theon/Reek resists, she reminds him of who he really is: Theon Greyjoy of House Greyjoy, the last surviving son of Balon Greyjoy. But that poor man is broken. He won’t betray Ramsay for anyone, not even Sansa. Theon/Reek goes to his master and tells the Madman of Sansa’s plan. Instead of confronting her right away, Ramsay plays mind games, telling her how happy he was that she is so beautiful while they walk through Winterfell. They eventually stop just so he can show Sansa the ravaged, flayed body of the servant who recently assured her that “the North remembers.” I bet Joffrey is looking pretty good right now. At Castle Black, Lord Commander Snow is preparing for his journey to unite the Wildlings before winter really gets going. It’s already snowing and the cold has set in with a vengeance. Snow’s brothers are justifiably pissed about his plan, except for Sam. 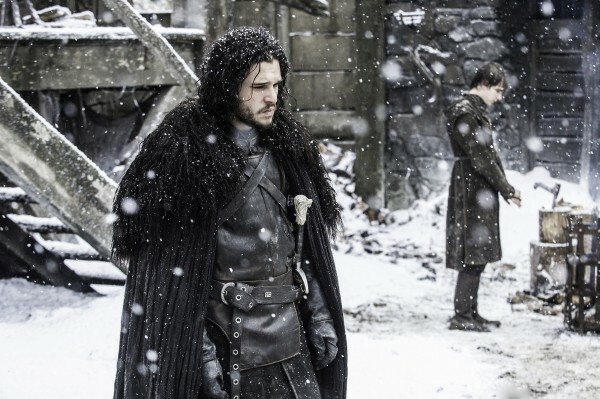 He knows why Jon is making this move, but the others could care less. First Ranger Thorne, who will be in charge while Jon is away, lets his Lord Commander know how the brothers feel, but with more respect. Jon is aware that his decision is unpopular, but one that must be done. Inside, Maester Aemon is fading fast. Gilly and her baby sit with him, providing comfort until the end. As the ailing Maester begins to fade, he speaks of his brother Aegon, whom he affectionately called “Egg.” Sam comes in, afraid of the inevitable, but Gilly knows better. Maester Aemon will not last the night, and he doesn’t. Aemon Targaryen’s watch has ended. Meanwhile, Stannis and his crew are on the road to Winterfell. Already, the weather has claimed forty horses and the Stormcrows have taken their five hundred men and hightailed it to warmer climate. Ser Devos begs Stannis to retreat and try again another time, but the King will not hear of it. He already retreated after the battle at Blackwater, he won’t do it again. Stannis tells him that he will either be victorious or die trying. After the Onion Knight is dismissed, Stannis speaks to Melisandre, asking her if she is sure about her vision. Not one to be questioned, she reminds Stannis that he saw the same vision and should trust in the Lord of Light. Stannis would rather see Melisandre naked, but she rebuffs his advances. She would rather he use his daughter Shireen’s blood to make him stronger for battle. And although Stannis is a stern, very taciturn man, the Princess is his weak spot. The King will not hear of any harm coming to his daughter, and upset, tells Melisandre to get out of his tent. If the Red Woman wants to keep her hold on Stannis, she may want to steer clear of his daughter. 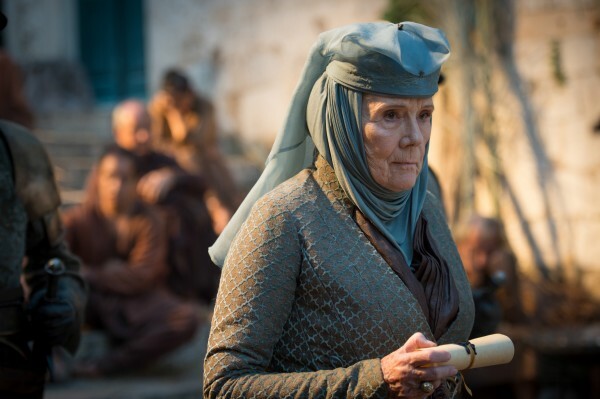 In King’s Landing, Lady Olenna is showing everyone her thorns. She is peeved about her grandchildren being imprisoned by the High Sparrow (meaning Cersei) and is pushing her weight around to get them out. She visits the High Sparrow and uses threats, offers of money and anything else she can to get Loras and Margaery out of the Black Cells, to no avail. The High Sparrow is truly a man of the gods and will not let greed cloud his judgment. Later, Lady Olenna meets with Littlefinger in his ruined brothel to discuss their plans. Littlefinger assures the Queen of Thorns that he is still working with her and not for Cersei. She tells him in no uncertain terms that if he tries to play her, he will surely regret it. To show his loyalty to their plan, Littlefinger reveals he has sent someone to see the High Sparrow who could turn the tide. But who could it be? Elsewhere, King Tommen is beside himself about his Queen’s imprisonment. He feels utterly helpless. His mother tries to console him, but he gives her some news she doesn’t like: that he loves Margaery. We all know that Cersei only wants her children to love her and no one else. But Tommen is a young King in love and he wants his wife. 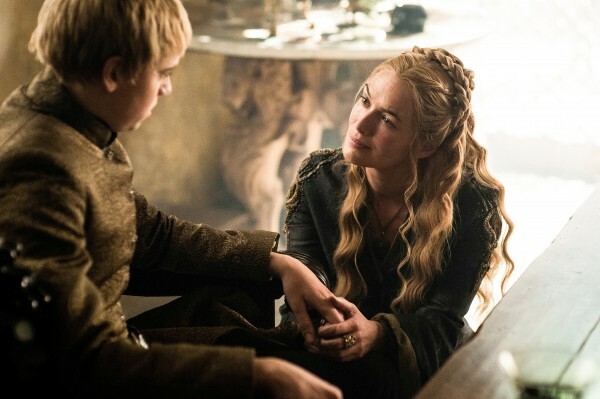 Cersei tells him that she will speak on his behalf to have Margaery released. Sweet, sweet Tommen believes her and is temporarily placated. In the Black Cells, a smug Cersei visits Margaery, pretending to care about her predicament. She brings the Queen some food, which is refused. Margaery knows why she’s in that hole and it’s because of Mommy Dearest-in-law. She wants nothing to do with Cersei’s false concern. After leaving her daughter-in-law, Cersei meets with the High Sparrow, who waxes poetic about the chapel they are meeting in. It is plain, made of stone but beautiful. He starts going on about how if the layers from each great house were pulled back, what would be revealed? He asks the same about Cersei, which makes her spidey senses go up. The High Sparrow then tells of a young man from a great house who removed all of his layers, revealing everything, particularly about the Queen Mother. That young man is the former Lancel Lannister, now a member of the Faith Militant. For those of you who don’t know, Lancel is Cersei’s cousin and a former lover. I don’t know what it is about those Lannisters, but as pretty as they all are, I have no idea why they choose to sleep with each other. But I digress. Lancel steps out of the shadows and stands right next to the High Sparrow. Cersei knows something is amiss, but as always, thinks she is beyond such things. But the High Sparrow takes his job seriously and has Cersei arrested and thrown in a cell. Before the guards close the cell door, Cersei says, “Look at me! Look at my face! It’ll be the last thing you see before you die.” Tywin would be proud. In Dorne, Jaime is imprisoned in what looks like the most comfortable jail cell ever. 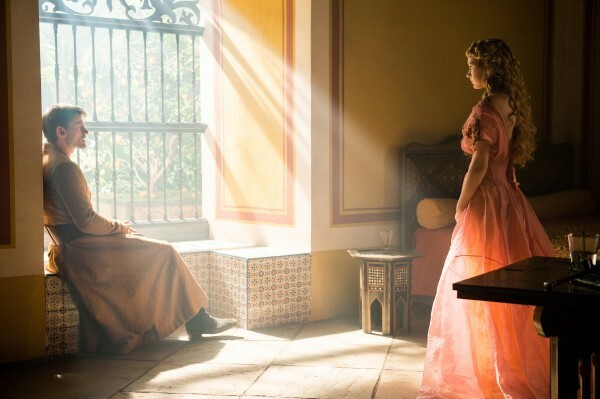 In walks his niece/daughter Myrcella, who wants to know why Jaime is in Dorne. He tells her of the threat against her life and plan to take her back to King’s Landing. Myrcella isn’t going anywhere because, you guessed it, she loves Tristane and wants to marry him. She is annoyed because when she was sent away, she didn’t want to go and now that she wants to stay, her mother wants her back home. Forget that noise, she’s staying in Dorne. Not the answer Jaime wanted to hear. In a more traditional cell, Bronn is singing that same tune we heard last week, but this time he gets to finish it. Across from his cell are the Sand Snakes, with Tyene taking an interest in our favorite sellsword. She flirts with Bronn, even showing him some Dornish skin, which he finds most appealing. So appealing that he begins to choke. I mean she’s hot, but come on! Wait, he’s really choking! Tyene is definitely her father’s child, because the blade she used to cut Bronn was laced with poison. Is this the end for him? Nah, Tyene’s got the antidote and tosses it over to Bronn just in time. She may be the youngest, but that girl is just as dangerous as her sisters. Across the sea, Dany is having pillow talk with Daario, who is none too pleased about her marriage to Hizdahr zo Loraq. He wants her to marry him instead, but she knows it wouldn’t be a good idea for relations with her subjects. Daario may be a lot of things, but a great adviser he is not, which Khaleesi knows in her heart. He tells her that on opening day of the fighting pits, she should slaughter every one of the masters to show her strength. Will Dany listen to his advice? Meanwhile, Jorah is being sold by the slaver Malko (played by the always fantastic Adewale Akinnouye-Agbaje) at auction to the highest bidder. Malko weaves a string of mostly false tales to get the bidding going, which works. Jorah is sold for a decent sum while Tyrion looks on. Not to be left alone, Tyrion tells Jorah’s new master that he must buy him, as the men are a team. Met with laughter, Tyrion surprises the slaver holding his chain and begins to beat him with it. The master likes what he sees and agrees to purchase Tyrion. They all make their way to Meereen, where the master is to test his men before any are chosen for the fighting pits. But they are all surprised when Dany makes an appearance with her intended. The men salute their Queen, putting on a bloody show which makes Dany queasy. She wants to leave, but Hizdahr tells her that it is tradition to stay until the end. Jorah sees Dany from afar and decides to make his entrance. He puts on a helm and comes out swinging. He beats everyone down, making an impression on Hizdahr and the Queen. Once he’s done, he takes off his helm, to Dany’s surprise and fury. She wants Jorah out of her sight, but he reveals he has a gift for her. Tyrion, who was released from his chains, comes out and introduces himself to Dany. 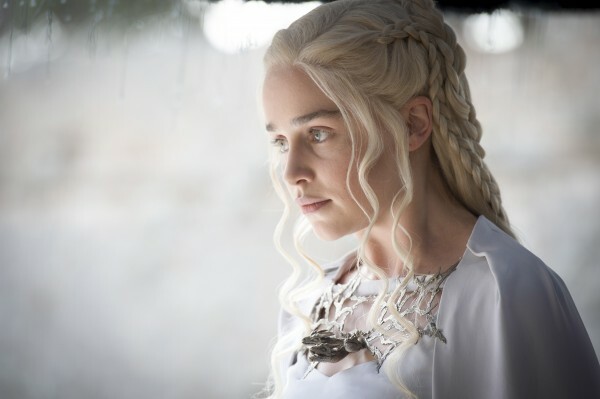 Will she forgive Jorah for his past treachery? Will Tyrion keep his head long enough to help Dany get to the Iron Throne?